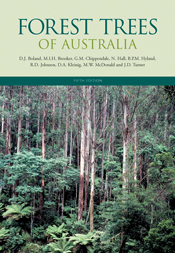 An essential reference for observing, identifying and obtaining information on the native trees in Australia. It describes and illustrates over 300 of the most important indigenous trees, which have been carefully selected for their environmental significance, their importance to the timber industry, or their prominence in the native landscape. This new and thoroughly revised edition has been fully updated throughout and includes treatments of 72 additional species. New maps and photographs show a diverse range of forests, from mangrove swamps, tropical regions and deserts, to alpine areas and stands of temperate forests. A colour section illustrates some of the major forest types of Australia and bark from a diverse range of species. Hardback. 768 pages. 260 x 190 mm. Photographs, Illustrations, Maps, Glossary, Bibliography.